(CNN) -- Newly released videos are raising questions about the military's continued use of live animals in simulated battlefield medical training. In the military training video, a monkey is monitored after being given a simulated nerve agent. The military training videos were acquired by the Physicians Committee for Responsible Medicine under the Freedom of Information Act. The PCRM claims the videos, which show the use of monkeys and goats in medical training, are evidence that the military is violating its own animal-welfare regulations. Military officials counter that the training is legal and vital to saving the lives of service members in the field. 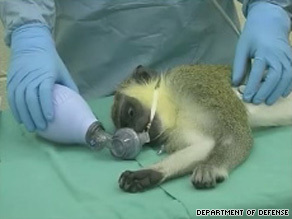 In one of the training videos, a live vervet monkey is anesthetized and then injected with a dose of physostigmine, a simulated nerve agent. The drug simulates some of the effects of a nerve agent, including increased perspiration, muscle spasms and difficulty in breathing. The military says trainees observe the effects of the physostigmine and then take steps to relieve them, injecting the animal with an antidote. The animal's complete recovery takes about 90 minutes, according to the military. "The animals recover completely and display no behavioral or physical ill effects from the exercise," a military spokesman said in an e-mail about the procedure. "No animal has ever died as a result of the exercise." In another video, a medical instructor uses a scalpel to slice open the leg of an anesthetized goat. The video goes on to show medical personnel applying a tourniquet and then dressing the wound. A third video shows a chest tube being inserted into an anesthetized goat. Jamie Campbell, a former U.S. Army medic, says the use of animals in medical training was "most definitely" an asset to him. "It was something you can't experience anywhere else," Campbell told CNN. "As of right now I don't believe there are simulations that can simulate the combat environment," Campbell said. "Patients move, arteries retract, the feel of blood, the feel of muscle, the feel of tissue -- that's something I don't feel a manikin or a video can simulate." Campbell did say, however, that the use of monkeys in simulated nerve-agent exercises might not be necessary. "With this type of scenario, an alternative may be able to be used. You know convulsions. You know vomiting, things that can be acted out ... this is something I think they could find an alternative to." The former medic also said that no amount of training can truly replicate real combat. "Working on an animal -- although it replicates a lot of the injuries -- it can never replicate working on the guy you talked to a half-hour ago. Or working on the person who showed you pictures of his daughter," Campbell said. "But working on the goat trained a lot of medics to save lives, and without that training, how many more casualties would we have had?" The PCRM argues that the use of monkeys and goats in the exercises is against military policy and that alternative training methods are available. "Battlefield medics and others caring for our troops should receive state-of-the-art, human-centered training," the PCRM's Hope Ferdowsian said in a news release. "Training with goats and monkeys is inhumane and violates military animal welfare regulations. It also offers an inferior educational experience. "Treating a goat with an artificially created wound is very different from caring for a human casualty," Ferdowsian added. The PCRM, joined by 17 former military doctors and medics, has filed a Petition for Enforcement with the Army surgeon general and other military leaders to halt the practices. The organization says one of the former military doctors calling for a halt to the practices is retired U.S. Navy Capt. Charles Rosciam of the Medical Service Corps. Rosciam served 13 months in combat and treated more than 100 casualties, the PCRM says. Military officials say the use of animals is conducted under strict compliance with animal welfare regulations. "We are dedicated to employing the best available training techniques to prepare our medical care providers to treat battlefield injuries while minimizing the use of live animals," the military spokesman said. "To this end, the Medical Chemical Biological Casualty course makes extensive use of manikins and computer-based training."